Chimney Rock in Nebraska, Kathy Weiser. Designated the Chimney Rock National Historic Site, Chimney Rock is one of the most famous and recognizable landmarks for pioneer travelers on the Oregon California, and Mormon Trails, a symbol of the great western migration. Located approximately four miles south of present-day Bayard in Millard County, at the south edge of the North Platte River Valley, Chimney Rock is a natural geologic formation, a remnant of the erosion of the bluffs at the edge of the North Platte Valley. A slender spire rises 325 feet from a conical base. The imposing formation, composed of layers of volcanic ash and brule clay dating back to the Oligocene Age (34 million to 23 million years ago), towers 480 feet above the North Platte River Valley. After examining over 300 journal accounts of settlers moving west along the Platte River Road, historian Merrill Mattes concluded that Chimney Rock was by far the most mentioned landmark. Mattes notes that although no special events took place at the rock, it held center-stage in the minds of the overland trail travelers. For many, the geological marker was an optical illusion. 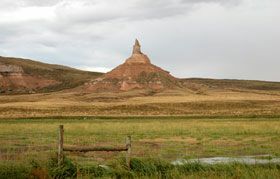 Some claimed that Chimney Rock could be seen upwards of 30 miles away, and though one traveled toward the rock-spire, Chimney Rock always appeared to be off in the distance—unapproachable. Because of this optical effect, early travel accounts varied in their description of the rock. Some travelers believed that the rock spire may have been upwards of 30 feet higher than its current height, suggesting that wind, erosion, or a lightning strike had caused the top part of the spire to break off. Throughout the ages, the rock spire has continued to capture the imaginations and the romantic fascinations of travelers heading west. Chimney Rock and its surrounding environs today look much as they did when the first settlers passed through in the mid-1800s. Erected on the southeast edge of the base in 1940, a small stone monument commemorates a gift from the Frank Durnal family to the Nebraska State Historical Society of approximately 80 acres of land, including Chimney Rock. The plot of land that the State owns provides a buffer zone to protect the historic landmark from modern encroachment. The only modern developments are Chimney Rock Cemetery, located approximately one-quarter mile southeast, and the visitor center nearby. Chimney Rock was designated a National Historic Site in 1956. The visitor center provides information on the history of the Overland Trails and Chimney Rock. The Chimney Rock Visitor Center is located 1.5 miles south of Highway 92 on Chimney Rock Road near the town of Bayard. The center houses museum exhibits, media presentations, and other educational materials concerning life on the overland trails, and a museum shop. It is open daily with a small admission charge. An important stop along the Oregon Trail during its later days, Fort Mitchell was built and manned in the fall of 1864 by Company “H” of the Eleventh Ohio Volunteer Cavalry under Captain J. S. Shuman. It was named in honor of General Robert B. Mitchell, who ordered the establishment of several sub-stations along the Great Platte River Road between Julesburg, Colorado and South Pass, Wyoming. The post was surrounded by a stockade with a sally-port, firing loop-holes, and a sentinel tower. A nearby “road ranch” served as the Scott’s Bluff stage station. In February 1865 they helped defend Mud Springs Station against an attack by the Cheyenne. 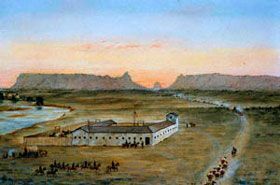 In June 1865 they rescued Fort Laramie troops ambushed by Sioux Indians near Horse Creek. Fort Mitchell was abandoned after the Fort Laramie peace conference of 1867. Today, there are no remains of the fort located about ½ mile south of the junction of Highways 92 and 29 east of Mitchell, Nebraska. See more HERE! The earliest travelers to use the pass were probably fur traders and missionaries in the 1820’s and 30’s. The first transcontinental wagon train through the pass was the Bidwell-Bartleson Expedition, comprised of 80 emigrants bound for Oregon with the Catholic missionary Father De Smet in 1841. East of the pass lies the site of a trading post established by a Frenchman, either Joseph or Antoine Robidoux, in the late 1840’s. Robidoux sold a variety of goods and provided blacksmithing services for travelers. One emigrant described the post as a log shanty with a blacksmith’s forge on one end and a grog shop on the other. Other trading posts are known to have existed near the pass at that time, including one owned by the American Fur Company, but Robidoux’s is most often mentioned in diaries. The heaviest use of the pass was during the Oregon Migration and the California Gold Rush of the 1840’s. Following the opening of Mitchell Pass in 1851, which provided a shorter trail, Robidoux Pass, and the trading posts fell into disuse. Today, there are no remains of the historic buildings at Robidoux Pass, but, wagon ruts and several markers show the original path of the trail. Early accounts of the trip through this area note several burials at the pass, two of which can still be seen today. Tools, wagon implements, bullets, and other materials have also been found in this area, helping to pinpoint the location the trading post and the blacksmith shop. Robidoux Pass, which has been designated a National Historic Landmark, is located south of Scotts Bluff National Monument, ½ mile south and eight miles west of Gering, Nebraska off Highway 71 on Robidoux Road. 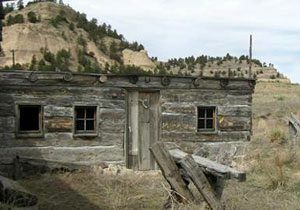 A life-size reconstruction of the Robidoux Trading Post can be found in Carter Canyon, located one mile south of Gering on Highway 71 and eight miles west along Carter Canyon Road. Visitors wishing to explore both Robidoux Pass and the reconstructed Robidoux Trading Post can access both sites by driving to Robidoux Pass then following Rifle Site Pass Road south to Carter Canyon Road. The site is open to visitors who can take self-guided tours.